Also known as the “city of canals”, Venice is the capital of the region of Veneto. Stretching across many small islands, the city of Venice is truly a place worth visiting. 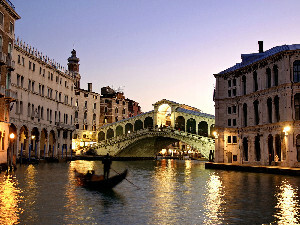 Venice, Italy is an extremely popular vacation and business destination in the world. Visitors can easily reach the city by plane and it has good connections to several major cities the world all over. There are two major airports in the city which are the Venice Marco Polo Airports and the Treviso Airport. Generally, traveling to Italy by flights promises to be a hassle-free experience. Located few kilometers from the city center, Marco Polo Airport handles a wide range of flights to many cities across the world and is used by several major international airlines as well. Keep this in mind, when searching for cheap airline tickets to Venice. Major airlines using this airport include Air Canada, Malaysia Air, Qantas, Air New Zealand, Thai Airlines, United Airlines Delta Air Lines, Northwest Airlines, British Airways, Continental Airlines American Airlines, Italy's national airline and US Airways. Named after Marco Polo, a Venetian traveler, known to have been the only European who rediscovered china, Marco Polo Airport is regarded as one of the three major airports found in the northern region of Italy. The airport offers scheduled bus services to the railway stations of Mestre- Venice and Venice-Snara Cruz. One of the major advantages of the Marco Polo Airport to travelers is its close proximity to the city center, which is about few minutes either by airport bus service or land taxi. Here you will find a good number of car rental companies. The airport is one of Italy’s major point of entry. Some of the facilities found here include Bureau de change, fine restaurants, cafés, Car hire companies - including Avis, Europcar, Hertz, Maggiore, Sixt and Thrifty, well-equipped meeting room within the VIP lounge, two major 24-hour car parks, a multi-storey car park that faces the terminal building and an open-air car park. Venice Treviso Airport is the second busiest airport in Venice. Located about 30 km from the vibrant city center of Venice, Treviso airport is a very small airport with budget flights to destinations such as Germany, Belgium, Spain and London. With over 8 million passengers flying through the airport annually, Venice Treviso airport is ranked fifth among the busiest airport in Italy. Sometimes referred to as San Giuseppe airport, Treviso arrival halls has several amazing facilities such as bureau de change, tourist information booth, car hire companies and plenty of tour and airline offices. Remember this, when looking for cheap airline tickets to Italy. Whenever you are planning on visiting Venice, there are several factors to consider including the weather conditions. Most people will prefer clear blue skies with little or no rain. Each of the seasons in Venice has its own unique charm and magic. However, the best time to go on holidays to Venice is during spring months of March – May. In these months, the weather is pleasant and perfect for a lovely vacation experience. The cheapest international flights to Venice are on Mobissimo, the free travel search engine. In addition to cheap international flights to Venice, we help you find the best rates to both major and boutique hotels in Venice. Consider flexible travel dates when looking for the best fares to Venice, off-season travel or off-peak hours, or mid-week flights are all good options to lower your airline ticket fares. Consider also flying to other international airports in Italy : Alghero, Ancona, Brindisi, Bergamo, Bologna, Bari, Bolzano, Cagliari, Crotone, Catania, Elba Island, Florence(IT), Foggia, Forli, Genoa, Lampedusa, Milan, Naples(IT), Olbia, Perugia, Parma, Palermo, Pantelleria, Pisa, Pescara, Reggio Calabria, Rimini, Rome, Lamezia Terme, Taranto, Trapani, Turin, Trieste, Treviso, Tortoli, Verona. Mobissimo is also available on Facebook , Twitter, and other social networks, and our blog post fantastic flights deals to Venice daily.